Woody's You Tube Channel "Woody Piano Shack" features great videos on synthesizers and music technology brought to you in an upbeat manner by a really good keyboard player. We had a chance to ask a few questions about his background and his YouTube channel and feature a few highlights from his epic MODX live stream. YamahaSynth: Where are you from? Woody: I'm a Welshman who grew up on the South Coast of England. I moved to Sweden about 20 years ago and settled in Stockholm. I guess you could call me a European! 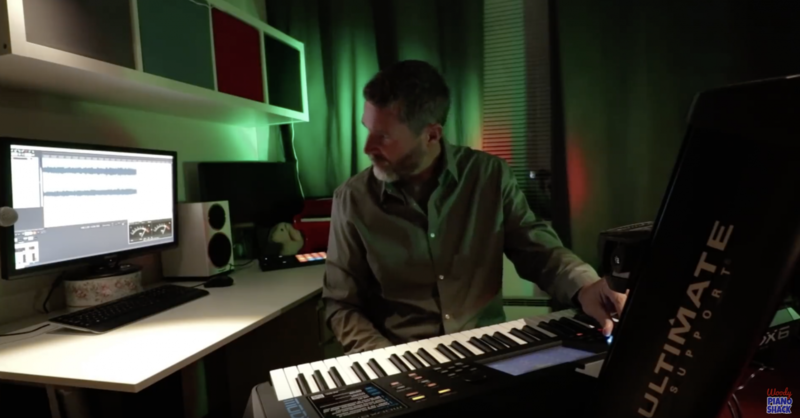 YamahaSynth: What is your musical background? Woody: My grandmother was a music teacher so I was fortunate to get an early start when I was about 4 years old. I practiced classical piano until my early teens. At that time I realized I could play by ear and entertain my school mates by performing popular hits of the time. My Dad owned an MS-20 and Juno-6 so I quickly learned how to create my own sounds and imitate my favorite artists. After leaving school I played piano in pubs and piano bars. My first band was a synth duo called Parallel where I gigged with my father's analogue synths. It was generous of him to let me take them on the road and it probably took a lot of persuasion! That's how my musical career started and I've been a semi-professional musician and passionate about music technology ever since. YamahaSynth: When did you start your YouTube channel? Woody: I started my channel during the 2016 Christmas break. I had watched a lot of music tech channels and was curious if I could do it myself. I bought a synth to review and some recording gear and got to work! Later I hunted down some classic 80s digital synths, including the Yamaha DX7, and that's when my channel really took off. YamahaSynth: What type of information would you like to convey to subscribers of your channel? Woody: The purpose of my channel is to share the musical knowledge I've accumulated over the years. I try my best to do it in a friendly and informal way which hopefully entertains and inspires my audience. I sometimes get messages from viewers who have purchased their first keyboard or taken up an instrument after a long break, and that makes it all worthwhile. YamahaSynth: What do you like about MODX? Woody: For me, it's a great all-in-one keyboard. All the "bread and butter" sounds I need are there, piano, electric piano, organs and so on. I'm happy that the arpeggios from the Motif are carried over and expanded on. The FM engine is the icing on the cake and no doubt I'll be importing and enjoying my favorite DX7 presets all over again! Check out some of the highlights from his MODX live stream below!